Just what could "Baby Hulk" do with brains, biceps and 500 Major League at-bats? JUPITER, Fla. — Tyler O'Neill is the best brand the Cardinals have right now. If you're into the whole "Baby Hulk, smash home runs" type. Okay, I'm possibly the only person calling him "Baby Hulk" right now, but the dude did just bench press over 400 pounds. He does smash home runs. 35 in 2018, to be exact (Triple-A Memphis and MLB combined), and it only took him 368 at-bats to hit those 35 home runs. Should I mention he already has 127 home runs as a minor-leaguer? But he's not just muscle. 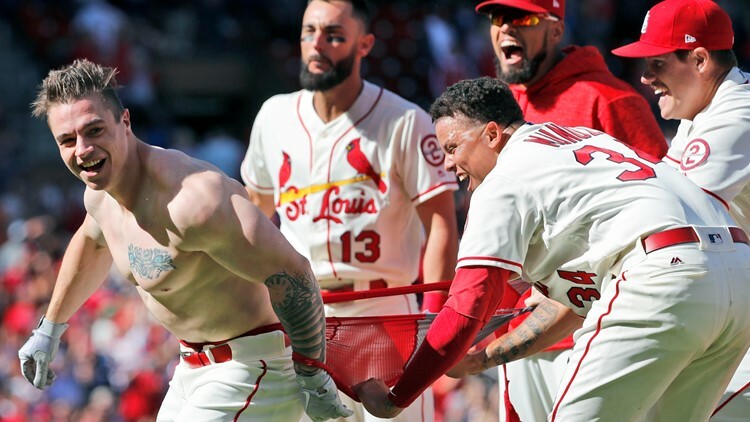 "Bro-Neill," which isn't a nickname he's ashamed of accepting, also has the hair (Mohawk), the attitude (cocky confidence) and the work ethic (relentlessness) to possibly become one of the most marketable stars to wear a Cardinals uniform in decades. Before 5 On Your Side Sports' Frank Cusumano could even finish his question, "If you got 500 at-bats, could you hit 30 home...?" "Mmhmm," interrupted O'Neill. "To my knowledge. I know when I get goin', I get going.'" In other words, give "Baby Hulk" 500 at-bats and a possible NL home run champ emerges. Both Frank and I hung out with "Bro-Neill" at the Cardinals' Spring Training complex in Jupiter, FL Wednesday morning. On top of his great hair, bulging muscles and boyish charm, the Cardinals outfielder also possesses an insane work ethic. "It's a lot of dedication in the gym," O'Neill said. "It's dedication when I'm eating at the table. It's the dedication to getting my sleep, not fooling around, doing stupid things," he said. O'Neill isn't afraid to admit that he's taken up a more ascetic discipline as well, in order to help avoid the injured list. "I've been doing a lot of yoga this past off-season. A lot more running than I normally do," he said. When it comes to 23-year-old emerging Major League Baseball outfielders, what more can you ask for? Can't you just see the muscle-man-t-shirt-sporting kids donning the Mohawk after every home run? The women swooning each time O'Neill rips his jersey in half after a walk-off hit? Bros high-fiving other bros who celebrate with protein shakes instead of Budweisers? The Cardinals have a self-aware, fun, hard-working, body-builder with elite hand-eye coordination who can hit a baseball a mile. Not that I want to see anyone fail in order to make room for him in the everyday lineup, but I can't wait to see what happens when Baby Hulk gets 500 at-bats. He will hit home runs. He will be fun. He will make people watch. "I wanna help the Cardinals win ... That's just who I am. I'm a gamer," he said. "This is the type of gamer that I am and I'll do anything to get what we want to do and that's winning a championship."